Thank you for inviting me. I've been coming here to London pretty much my whole life. As a young girl, I would come to visit my grandparents, and occasionally still, I visit my aunt and uncle, Darlene and Aulis Laine, who are with us here in the audience today. I recently told my mom that I would be visiting Aulis and Darlene, and that I was speaking at the CURA conference here in London . My mother sent me an email, and with a few anecdotes, she reminded me about my grandparents, particularly my grandfather. Grandma Marg and Grandpa Alex were married for 74 years. He was away during the War for over 5 years while she raised the four children. Grandpa became an employee of the Grand Trunk Railways. There was no union in those days; you were paid only for the time you could work. Working people in his lifetime were subject to horrific strikes and abuse from the police. Later, during his time with the Canadian National Railway, there were improvements. The union helped to change working conditions. The mechanics at the CNR were closer to the future automobile workers than any other working group and were the beginning of the climb to a middle class. There was lots of housing to rent when they first moved to Stratford - small 2-story 3 bedroom brick homes, with hardwood floors, wood stoves in the kitchen and coal furnaces in the dark dismal basements. The lots were a nice comfortable size, tree-lined with cement sidewalks, paved roads. People lived in these houses with up to 10 children. They weren’t seen as slums. Before he died at 96yrs of age, he told my mom that the middle class, which had appeared in his lifetime, was struggling to maintain their status. He saw that the social benefits achieved after the war were disappearing. He could never understand why there was always money for wars but never a penny for affordable housing and social programs. Throughout his long life, and my grandparents’ long marriage, they never had the pleasure or the privilege of owning their own home. My grandfather was a CCF member and he had a sharp political mind. I wish he were here today to help me understand the cruelty and the absurdity of today’s political climate. He would be astonished that so many continue to have so little, and that so few in power seem to really care. It is absurd. Over this summer in particular, I have come to realize just how truly absurd and how illogical our entire social (i.e. our political and economic) system truly is. Just like what Alice found, when she fell down the rabbit-hole in Lewis Carroll’s story ‘ Alice ’s Adventures in Wonderland’. The world she found was absurd, but Carroll called it wonderland. This is where the title of my speech originated – It Ain’t Wonderland. The term ‘wonderland’ has entered our language to refer to a place that is like a dream come true – like a theme park! Well, the ‘wonderland’ for people I’m seeing, those facing hunger, homelessness, the side-effects of psychiatric drugs, discrimination in the health care system, or those who are still trying to get their ODSP application accepted, is grim. For these people it’s no theme park to say the least. What is absurd about it all is that we keep canceling those few things that are working. Do we always have to cancel things that are working in this country? Did the federal government in 1993 really have to cancel our national housing programme? Did the Ontario government really have to cancel the ability for so many people to receive the Special Diet Benefit? Does the federal government really have to cancel the SCPI programme (Supporting Community Partnership Initiatives) next spring? Homelessness in a country as rich as Canada is a disaster and that is absurd. It is obscene. Eight years ago, homelessness was declared a national disaster. At that time, I naively thought it would lead to more than just a federal appointment of a Minister Responsible for Homelessness and some emergency relief monies. Many of us thought that it was reasonable to expect that the federal minister responsible for housing might get involved in a solution that would include housing. But no, that would have been too logical a response. This applies to the Canadian icestorm, it applies to the Winnipeg floods, it applies today to the situation on the Gulf Coast and it applies to homelessness in Canada today. From the end of World War 2 until 1993 – our national housing program built 650,000 units of housing, housing 2 million Canadians to this day. That is our legacy. The beginning of mass homelessness began with the 1993 federal budget, when all new social housing construction was eliminated. More than 175,000 potential new social housing units were lost when the programme was cancelled. I had the particular vantage point of being a Street Nurse working at what can only be described as the epicentre of homelessness in Canada, at the corner of Sherbourne and Dundas in downtown east Toronto. It was from that vantage point that I began seeing things I couldn’t at first explain, and things I couldn’t easily treat or prevent. Unlike the victims of an earthquake or ice-storm, the people I saw were victims of policy - a direct result of the 1993 cancellation by the federal government of the national housing program and the 1995 cancellation of Ontario ’s housing programme which coincided with the welfare cuts. I joined with several colleagues to form the Toronto Disaster Relief Committee in the summer of 1998. We wrote a report called the State of Emergency Declaration, which used statistics and referenced the UN Charters that Canada had signed. It was a passionate document, at a very basic literacy level,and it was to the point. On October 8, 1998 we held a press conference and declared homelessness a National Disaster. What we saw was not unique to Toronto . We believed that Toronto was the canary in the mineshaft of homelessness throughout Canada . First, that federal emergency relief monies be released to communities across the country so they could provide disaster relief for their rapidly growing homeless populations. This type of effort is what should have happened in the Gulf coast in the wake of Hurricane Katrina. Second, we called for a long-term solution, the 1% solution – a National Housing Programme, where all levels of government would spend an additional 1% of their budgets to build affordable housing. The 1% solution originates from research done by Professor David Hulchanski, who determined that when our federal, provincial, territorial and municipal governments were allocating money towards building social housing, they were spending on average 1% of their budgets. The first item we called for – the federal emergency relief monies, essentially occurred. Homelessness in Canada was catapulted on the national and international scene and shamed by UN condemnations of Canada ’s record on homelessness. Prime Minister Chrétien appointed Claudette Bradshaw as our first ever Minister Responsible for Homelessness. In 2000, ‘SCPI’ (Supporting Community Partnerships Initiatives) monies were rolled out across the country - hundreds of millions of dollars! So, Canada had the distinction of having a Minister Responsible for Homelessness but not a Minister with full responsibility for housing! The hundreds of millions of SCPI dollars, or as I like to call them ‘disaster relief monies’ have funded new shelter beds, renovations to drop-ins, shelters and food banks, programs that target homeless youth, identification replacement programs, even some transitional housing. The monies have saved lives and made people more comfortable in their state of homelessness but for the most part, has not housed them. Today I would like to revisit the concept of disaster, and whistle blowing about the situation we’re in, and what the future holds in terms of advocacy. We know it’s important to be whistle-blowers before a tragedy occurs but it’s also important to do so afterwards, no matter how many times the truth has been told and no matter what speaking out can do to your career. During the Toronto International Film Festival, I had the opportunity to see Spike Lee’s documentary When the levees broke: A Requiem in Four Acts. He tells it like it is – he had to. For those still living … there is no home. Climate experts have pointed out that the first flow of climate refugees has in fact been the people forced to move away from the Gulf Coast in the United States , not the low-lying islands in the Pacific as had been expected. There are an estimated 250,000 people still displaced from New Orleans . Pre-Katrina, 30% of the New Orleans population lived below the poverty line and Lee suggests in his film that class, not just race, was a major contributing factor to the inadequate federal response. You’ll see in Lee’s film the violent emotional reaction by New Orleans residents when they realize they are being called refugees in their own country. There are painful similarities between the victims of Katrina and those facing poverty and the housing crisis here in Canada . Both cases involve purposeful neglect by policy makers and politicians, for example, decisions to not fund infrastructure, whether it be levees or housing and decisions to hold back promised monies. In both cases huge numbers of people are displaced, dislocated and left to die. Earlier this year the United Nations Committee reviewed Canada ’s status as signatory to the International Covenant on Economic, Social and Cultural Rights. Their statement says that the reported numbers of homeless people in Canada range from 100,000 to 250,000 and in addition that the per cent of Canadians in core housing need (i.e. vulnerable to become homeless) remains high at approximately 15%. The UN recommended that federal, provincial and territorial governments address homelessness and inadequate housing as a national emergency. This is extremely strong language from this august body. Funding for Phase 1 of SCPI which ran from 2000 to 2003 was $305 million. Phase 2 which ran to 2006 was $405 million. $134.8 million was added for one additional year. The programme is due to ‘sunset’ or in real language, is cancelled at the end of this fiscal year in March 2007. To make matters more stressful and difficult, towards the end of this summer at least six Ontario municipalities were told by federal officials to expect cuts of one third of their promised allocation for 2006. It was London that first blew the whistle on the disappearing money, leading to a national hue and cry. We won that battle by mobilizing nationally and we appreciated the London participants at our September Day of Action in Toronto . But today, we are still fighting for the program to continue after March 31, 2007 . We are always trying to fight to hold our ground, to save programs from even further cuts or cancellation, let alone getting any new money. Let me give you a very recent example of how desperate the fight is for the most basic life-saving programme. During this summer’s heat wave, I pleaded with the City of Toronto to alter their formula for calling heat alerts so that alerts could be called early enough to provide people relief. I pleaded that they not wait as they did several times and call the alert on a Sunday when both social service agencies and media are down to skeleton staff; I begged them to relocate the one 24 hour cooling centre out of the Metro Hall lobby to a more comfortable and accessible location; I begged them to open more than one 24 cooling centre for a city of 2.5 million people; I begged them to provide something more substantial than a cereal bar to people using the cooling centres; and I begged them to modify the City by-law that makes 3rd and 4th floor windows in rooming and boarding homes restricted from opening no more than 100 mm (3 inches). In addition, Michael Shapcott led the campaign to identify longer term solutions which could include heat island mitigation strategies such as green roofs, the development of a maximum temperature by-law (similar to the minimum temperature by-law we have in winter that landlords have to comply with), and energy conservation measures for low-income housing. These could include energy rebates for landlords who install air-conditioning and pilot programmes to that effect. By summer’s end, the heat alert formula had not changed, Metro Hall was still designated as the site for the one 24 hour cooling centre, people still only got a cereal bar there and the request to modify the by-law and look at longer term measures seem to be sitting on the shelf. It seems nothing can be done in a Toronto election year except decide to dump our garbage near London . I’m telling you this story because the lack of innovation meant that thousands of people were left sweltering in hot rooming houses and high-rises, in some cases with room temperatures above 37 degrees Celsius. The people suffering and at elevated heat risk include people living in poverty - the frail elderly, persons experiencing serious mental health or health challenges, people on psychiatric medications, people living in isolation, with mobility issues, under-housed and homelessness. In Parkdale alone the estimate is that the number of people at elevated heat risk is 1,200. By and large they do not have the means, nor the energy, nor the motivation to go to the lobby of a government building to sit and receive a cereal bar. There were at least 5 heat-related deaths during the 2005 heat wave in Toronto , primarily rooming house tenants. Both the Toronto Disaster Relief Committee and the Toronto Board of Health (of which I’m a member) requested the Coroner consider holding an inquest into the heat-related death of James Howell. One year later, the Coroner advised there would be no inquest because there is nothing to be learned. Despite repeated requests to the Coroner’s office, they will not issue that decision to us in writing. Broad scientific research has shown that the greatest life-saving measures in an extreme heat emergency is access to air conditioning. Yes it may raise hydro costs, but we are not talking about people who use cappuccino machines, food processors, hair dryers, computers, TV/VCR/DVDs. In some cases we are talking about people who don’t even have a fridge or stove, a washer or dryer. Poor and vulnerable populations tend not to be energy hogs. Do we need dozens of deaths before we do something? Then I hope our film would show where our politicians live, where they shop and what they say when they’re asked about these issues. Condoleeza Rice had lots of time for shoe shopping during the Katrina aftermath, and I suspect a Canadian Spike Lee would be able to demonstrate that, in the face of our disaster, most of our political leaders have way too much time and on their hands. I am very convinced that the public cares about these issues. A recent ‘Raising the Roof’ survey showed that 80% of Canadians believe it is possible to solve homelessness. Somehow that sentiment is not being translated into action at the political level. Historically, when most progress has been made on the housing front it has been during times of minority governments. The current federal government is redefining its role and we must be vigilant, and we must be clear that we insist they have a role in housing. So, it is critical that you overcome any political differences you might have, and find ways to mobilize. We appreciated the London efforts to join us in Toronto on September 12 to fight for the SCPI continuation. Politicians hate housing report cards – how have your local politicians done when it comes to money promised, money spent, number of units built and affordability? November 22 is National Housing Day, the day the big city mayors’ caucus of the Federation of Canadian Municipalities endorsed the declaration that homelessness was a national disaster. We will be holding a car rally, a form of protest that has been used in the past in Canada . A focus of the day will be on SCPI continuation. Start today to make housing an election issue. 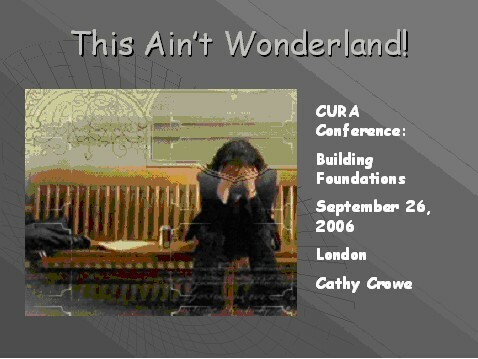 The title for my speech was inspired by the CBC television show This is Wonderland. It was a daring comedy/drama that captured life in what was probably a mental health courtroom in Toronto ’s Old City Hall . By the people who saw it, including homeless people, mental health outreach workers and even lawyers, it was widely considered to be a creative examination of the justice system and our attitudes toward people suffering from poor mental health or those living chaotic or unconventional lifestyles. It did so with absurd but real-life story lines mixing comedy and drama. This is Wonderland was rich with talent: created by George Walker and starring Cara Pifko as the young criminal lawyer Alice with a cast that included Michael Murphy, Eric Peterson, Jayne Eastwood, Janet Jason Leigh and Michael Riley, to name just a few. The show was recently nominated for 12 genies including best dramatic series and a best actress nomination for Cara Pifko. Earlier this year, the CBC announced it was canceling the show after its third season. Why is it that we always seem to cancel the things that are working in this country? The federal government did not have to cancel our national housing programme in 1993! The Ontario government did not have to cancel the ability for so many people to receive the special diet benefit! The federal government does not have to cancel the SCPI (Supporting Community Partnership Initiatives) program next spring! It is clear that ‘This Ain’t Wonderland’ for our most vulnerable populations. Especially with the reality of all of the absurdities and the cruelties we are seeing against them. I am asking all of you her today to please, let’s all work together to make housing an issue in the next election, and in every single subsequent election from here on in, until we get our national housing programme back and truly bring about an end to the man-made disaster of homelessness.